Last week, Jon Ralston, a veteran Las Vegas Sun columnist, dared reporters to ignore Donald Trump’s unveiling of his presidential endorsement — with low expectations about how that might play out. And, indeed, they didn’t, thereby sparking the latest mini-drama in the reality show otherwise known as the 2012 Republican presidential primaries. While any campaign reporter you meet will say it’s ridiculous to give any more oxygen to Trump in this election cycle (and some of them will even go so far as to mock the primaries’ circus-like atmosphere on Twitter) many of them still raced to cover the Trump endorsement. 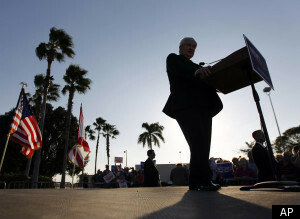 In their haste, several major news organizations — including the Associated Press, The New York Times, Politico and CBS News — erroneously reported that Trump planned to endorse former House Speaker Newt Gingrich. Countless others, including The Huffington Post, repeated those reports. All had to backtrack when it became clear former Massachusetts Gov. Mitt Romney would get the Trumpster’s nod. Come showtime, CNN, MSNBC and Fox News all had Romney live, standing at a podium featuring a Trump plaque, in a Trump hotel, accepting a Trump endorsement. Reporters swarmed the Trump event for the same reason they have pursued and then coughed up almost every other bit of minutiae, no matter how irrelevant or meaningless, around the primaries. In a media landscape replete with Twitter, Facebook, personal blogs and myriad other digital, broadcast and print sources, nothing is too inconsequential to be made consequential.